Design Notes is a show about creative work and what it teaches us. In this episode, guest host Aaron Lammer speaks with “robot tamer” Madeline Gannon about the work of her Pittsburgh-based research studio, ATONATON, which combines disciplinary knowledge from design, robotics, and human-computer interaction to innovate at the edges of digital creativity. Lammer and Gannon discuss how to make robots more approachable, how to design their personalities to work alongside humans as “machinic creatures,” and how she created Mimus, an industrial robot outfitted with sensors that bring out its curious personality. 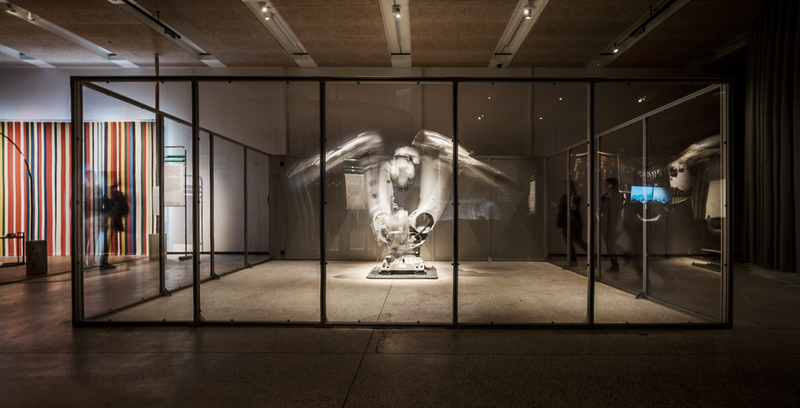 Gannon’s robot Mimus in her enclosure at the London Design Museum, as part of the exhibition Fear and Love: Reactions to a Complex World in 2016. The name Mimus is based on the latin root of ‘mimic,’ and is also the genus of the mockingbird family. Mimus is a “curious industrial robot” that weighs over 2,600 pounds, adapted from a welding robot used on car assembly lines. Gannon’s studio, ATONATON, explores the ways in which humans can better communicate with machines. Kinematics, the “geometry of motion,” is used in robotics to describe the motion of a mechanical system. Gannon collaborated with creative technologist Zack Jacobson-Weaver on a robotic massage head that also served as an exploration into how humans interact with machines. On the next episode, Liam speaks with illustrator Libby VanderPloeg about capturing the essence of place, how the physicality of art can influence outcome, and how to tell a story with a single image. Have feedback for Design Notes? Send an email and let us know what you think!